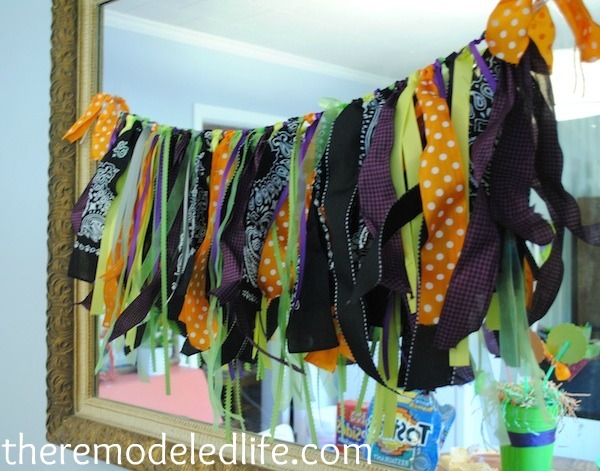 I'm continuing with our little party project theme today and sharing with you a few more diy party decorations that we did for my niece's sixteenth birthday. 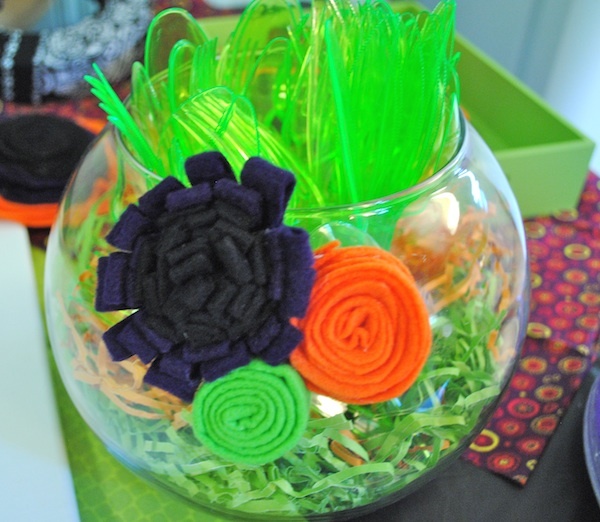 Last week I showed you the signature board and table centerpiece I made from items I already had and dollar bin finds. 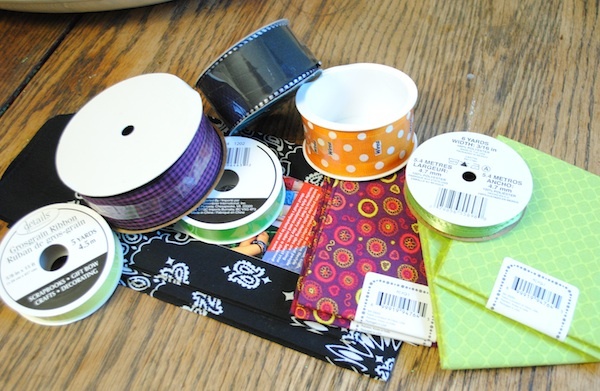 Today I'll let you know what I did with all of this ribbon (which I found either in the dollar bin at AC Moore or at the Dollar Store). I know you just can't wait. I tried to make things that my niece would want to use again and maybe even put up in her room. It's tough to gain the approval of birthday decorations from a sixteen year old but I got a huge thumbs up from Ashleigh on these next two. She actually got down right excited when she saw them, and I'm not even exaggerating. These are both so easy and inexpensive. 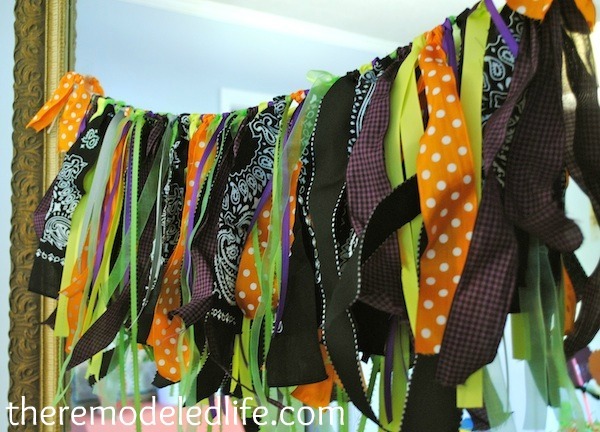 The first little project was a ribbon garland. I'm sure you've seen these all over pinterest and blogland. I think they are so cute. In order for this to work for my niece though it had to be a bit funky. Ever since she has moved in with us she has talked about wanting a room painted lime green, orange and purple. Even though we haven't busted out the paint brushes one this on yet I thought I'd give her some things in those colors to make her room more fun. 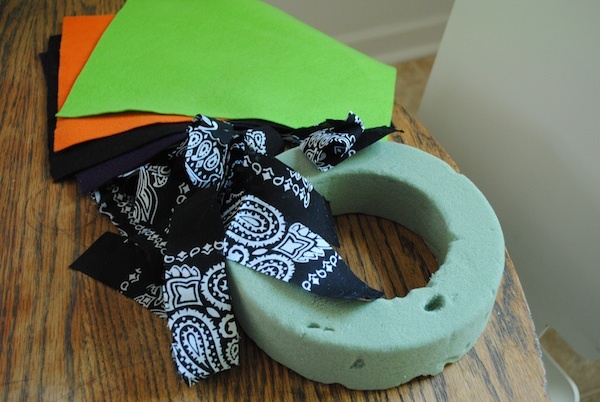 In addition to cutting my ribbon strips I also cut up a bandana to use with this as well. 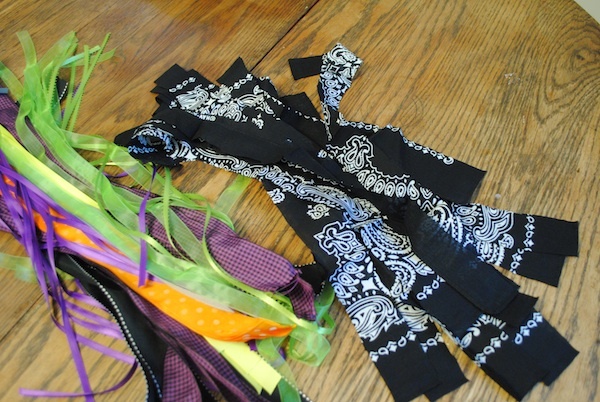 All this took were my strips of ribbon, a piece of yarn and me tying the ribbon on the yarn. Simple. So while I was making this, Justin thought that this was something I was making to actually leave in our kitchen for decoration - like all the time. When I asked him what he thought he said, ummm, well it's a little kermit the frog, haha! He kept asking me questions like, Where exactly are you putting this? and What exactly is this again? I finally realized he wasn't getting that this was a birthday party project so when I filled him in he let out a huge sigh of relief, realizing that I hadn't gone all wacky and kermit the frog on him. Although, Ashleigh thought this was the coolest thing ever and that was all that mattered. 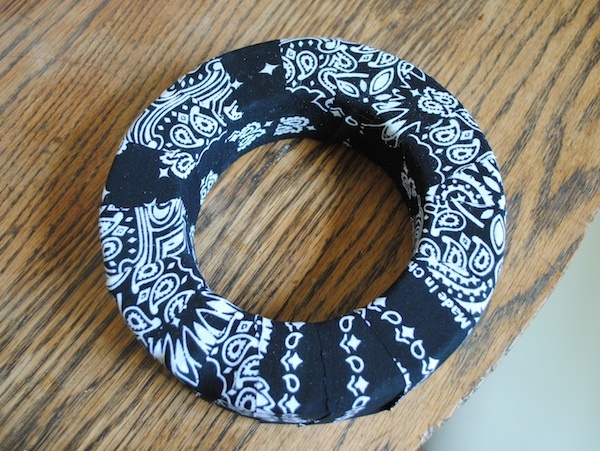 Ok, next up is a little bandana wreath I made from a beaten up old wreath form from the Dollar Store, a bandana (that I just cut in strips) and a few felt flowers. Just a little hot glue was all I needed. 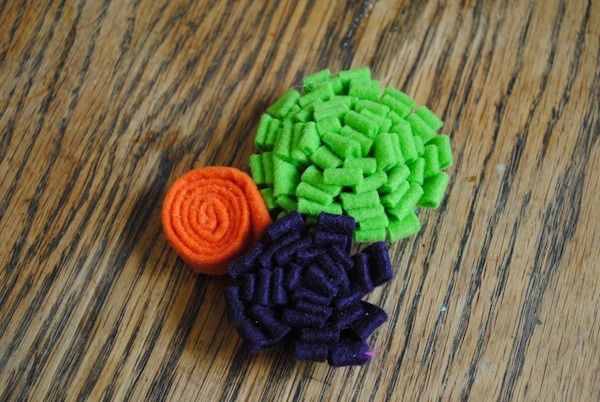 I have a little tutorial on how to make felt flowers, don't worry they are easy and it involves no sewing! 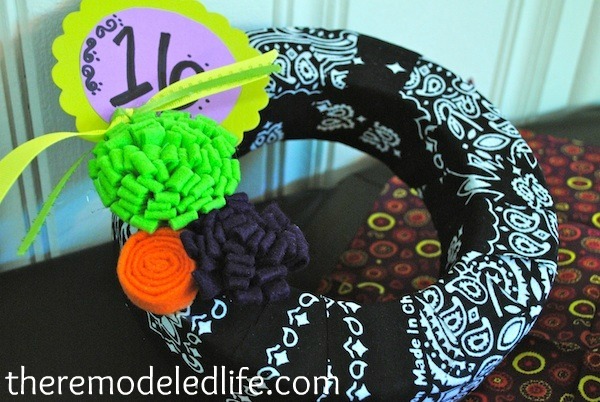 For some reason, this is the best picture I took of the final wreath. But, you get the idea. I also used a little flower cut-out I made to finish it off and make it birthdayish. 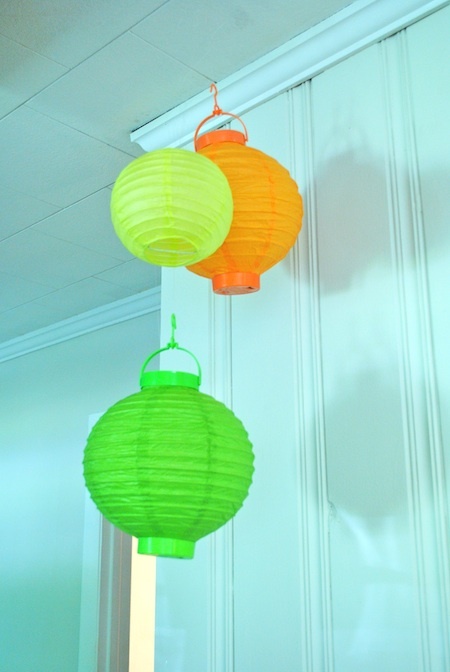 Once again - I scored some cute lanterns at the Dollar Store in our perfect colors. Always check there first!!! I think I'm all partied out now between this and the Senior Salute event. Don't forget to join us tomorrow for the first story in our new Share Your Story series!!! Can't wait!